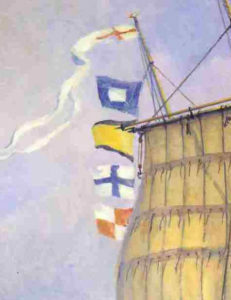 Looking for the very best in marine art? You have found it here. A ‘full on’ marine painting measuring 63 x 91 cm (28″ x 36″), oils on canvas, available price upon application. 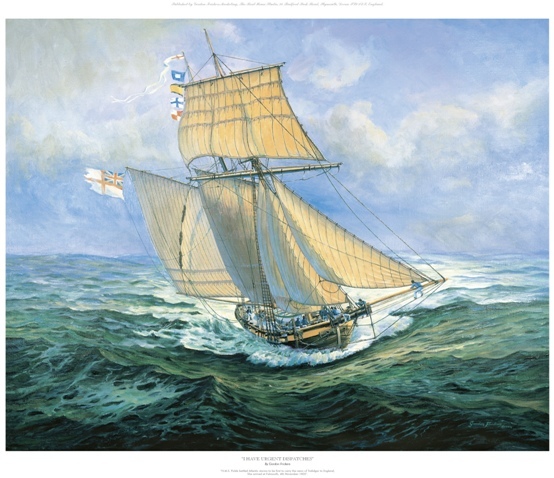 “I Have Urgent Dispatches”, His Majesty’s Schooner “Pickle“ was first to England with the official news of the victory at Battle of Trafalgar and death of Nelson. Chased in the notoriously stormy autumnal Bay of Biscay, October 1805, HMS “Pickle” recognised the other ship as British. 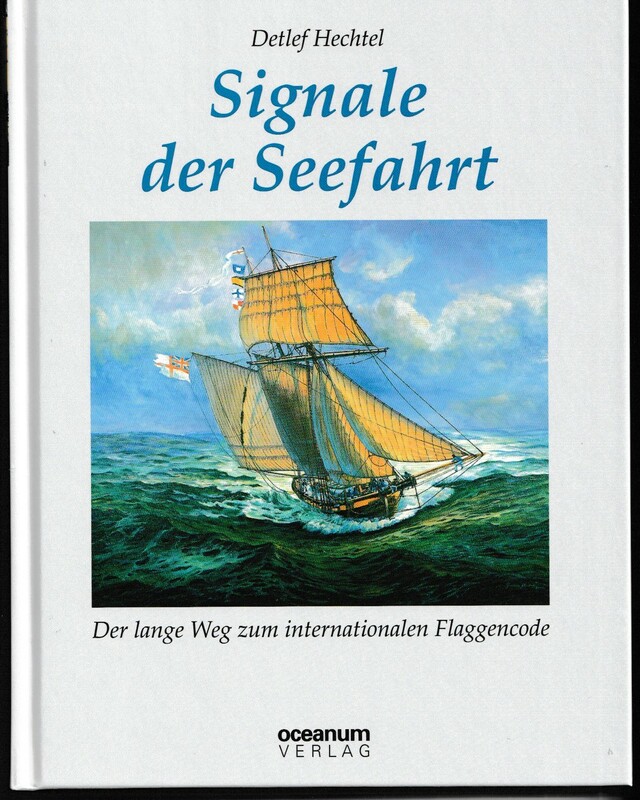 She hoisted the most dramatic signal of her career by flying the ‘new’ 1803 secrete code signal flags 2214 which read as “I have urgent dispatches” meaning ‘do not delay me’. Signal for your print via the Print Gallery page on the menu above. I was official marine artist to HMS Victory from 1994 to 1998. Fit for a Princess: Print copy No 1 framed with a menu, was presented to The Princess Royal, Princess Anne at HMS Seahawk mess, RNAS Culdrose, a dinner given in her honour in appreciation of her able assistance during the 200 th anniversary of Trafalgar and the recreation of HMS Pickle’s historic voyage with the Trafalgar dispatches. 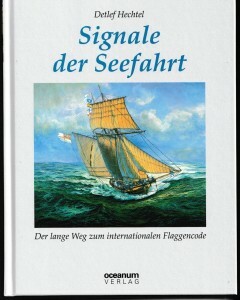 “I Have Urgent Dispatches” does and is likely to continue to appeared in books and a few journals (magazines), TV and videos and continues to sell steadily as a popular signed numbered edition. By the way the copyright is mine, licences can be issued as appropriate. The Royal Navy’s most celebrated Schooner, HMS Pickle. 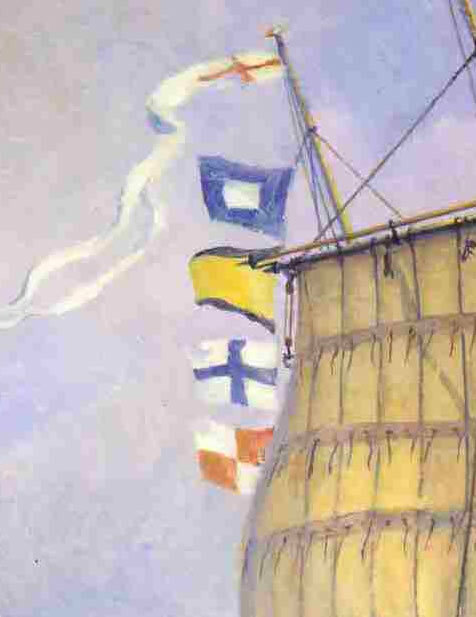 the schooner “Pickle” when chased then recognising the other ship was British so HMS Pickle commenced signalling her dramatic news by flying the 1805 code signal flags 2214 meaning “I have urgent dispatches” meaning ‘do not delay me’. H.M. Schooner “Pickle“ was first with the news of the victory at Battle of Trafalgar and death of Nelson. HMS Pickle arrived at Falmouth, Cornwall on the 4th of November 1805, a date still celebrated in the Royal Navy as “Pickle Night“. HMS Pickle is a great ‘communication’ story, then and now, and Pickle was the sort of size modern yachtsmen can relate to. My brief included working closely with the official Keeper and curator of HMS Victory, Peter Goodwin, looking at the lesser known interesting stories surrounding HMS Victory. Before settling on the likely appearance of HMS Pickle I carried out extensive research into schooners of the period. You can discover much more about HMS Pickle by following the “Further Reading” link below. This fine picture is available as a signed numbered Heritage print from www.frickers.co.uk Print gallery. The Keeper and Curator of H.M.S. Victory, Peter Goodwin said, “so convincing it makes me feel I could punch the canvas“. He added “it was Gordon Frickers who opened my eyes to the possibilities of paintings“. Trafalgar 200 commemorations: A large version, print number 1 was presented to Princess Anne the Princess Royal by officers of the Royal Naval Air Service, Culdrose, at a Trafalgar night dinner given in appreciation of her support of Trafalgar 2005 and the reenactment of the route of Pickle‘s captain, Lieutenant John Richard Lapenotiere. Princess Anne: Her secretary at Buckingham Palace said to officers at RNAS Culdrose: “the Princess was delighted to receive this beautiful picture”, “The Princess was over the moon”. The owner and some of the crew of the replica Hms Pickle, a great educational resource for children of all ages so that includes me, at present in NE England, have chosen large copies of “I Have Urgent Dispatches“. Gordon Frickers, 16.01.15: “I am honoured to discover people saying picture has becoming a part of the Nelson story. You can be part of the story, by owning a print of this definitive painting”. ‘Further Reading‘ If you love a good yarn and wish to discover more about HMS Pickle follow our link. Lest we forget: “It is upon the Navy under the Providence of God that the safety, honour and welfare of this realm do chiefly depend” – from the Articles of War (1652) read weekly to all Royal Navy ships crews for 300 years.